Trees are a great asset to have on your property. But they are also a major responsibility and require proper care and attention. This includes taking measures to protect them from pests. Pests in Oregon can include animals and insects, pathogens, weeds, and other organisms that cause damage. Focusing on prevention, instead of waiting until there’s an obvious sign of damage, could be the difference between keeping a tree or needing to remove it. Unfortunately, many people aren’t aware of how important early action against these pests is. They also don’t have any idea what to do about them. Here are some expert tips. These tips are part of the process known as integrated pest management (IPM). IPM is the approach to protecting your trees from pests in the safest, most effective way, with organic, environmentally friendly solutions, instead of relying on harmful chemicals. If chemicals are needed, they’re used as controlled and carefully as possible. Figuring out how to protect your trees starts with learning what pests are most likely to occur in Oregon. Different regions and climates lead to different pests. For instance, Oregon’s wet, mild climate can enable fungal disease growth. There are also certain insects commonly found in this region. 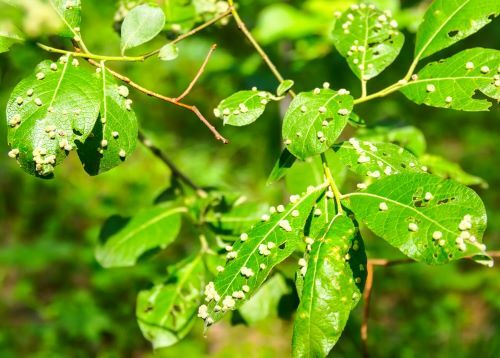 Tree pests in Oregon are usually sap-feeding, defoliating, and wood-boring insects, including aphids, elm leaf beetles, and bronze birch bore beetles. You should also look into how each pest affects your trees and which trees are more susceptible than others. By learning about the pests you’re likely to encounter, you’ll also be prepared for how to handle them. Once you know which pests to look out for, make sure to regularly monitor and inspect your trees. If it turns out you have trees that are susceptible to specific pests, check those even more often. You’ll want to recognize the signs of pests early, before damage is already done. Try to plant tree varieties that are resistant to the diseases common to Oregon. For example, conifers, birch, and mulberry trees are resistant to Verticillium wilt. If you want to plant apple trees, the liberty apple is resistant to diseases such as scab and powdery mildew. It’s also recommended you plant a variety of trees. That way, if one species of tree is affected by pests, it won’t destroy your entire landscape. It’s not as easy for pests to thrive when there’s more diversity. Additionally, planting different species can be more aesthetically pleasing. Make sure your soil has good drainage, proper PH, and balanced fertilizer. Soil conditions are important for the health of the trees. And the healthier the trees, the better their defenses will be against many of the pests in Oregon. The place where you plant the trees also matters. Trees should be planted in a location that allows them to have the optimal amount of sunlight, drainage, and space. The best conditions will vary depending on the type of tree. For example, some varieties grow best in partial shade, while others can handle full sun. And some trees are more drought tolerant than others. Also, keep in mind that newer trees usually require extra, more frequent care and watering. A favorite method for controlling pests is to apply dormant sprays. They are applied in the fall, winter, and early spring, which protects the trees from overwintering pests. This will also help prevent pests during the growing season. Be sure you are applying the sprays correctly. They are usually organic, and different sprays are used for different pests. Dormant oil smothers insects and eggs, lime-sulfur controls fungal diseases, and copper kills bacteria and fungal spores. Insect traps will help you identify which pests are affecting your trees and how many there are. The traps use pheromones to attract certain insects, which are then caught in a sticky substance. Ideally, by using these traps, you can take care of the infestation problem before it spreads to other trees or gets out of control. However, you should know that not all insects are pests. Learn which insects are beneficial, as they can actually help control pests. This includes ladybugs and praying mantises, both of which are known to eat aphids. Others are bees, ground beetles, and parasitic wasps. Dormant sprays will usually not harm these beneficial insects. However, pesticides can target beneficial insects and pests, so be careful and only use those when necessary. There are also certain insecticides, and also fungicides, that should only be applied when supervised by a certified arborist. Clean up the leaves and fruit that fall off the trees in the colder months. Certain pests, such as stinkbugs, can feed on the weeds and debris on the ground. Also, disease spores can overwinter on dead plant material, which means they could re-infect the tree if not removed. Fruit tree diseases can overwinter on old, dried fruit, both on the ground and still on the tree. You can remove the old fruit from the tree and add compost around the tree to help the leaves to decompose. One incredibly important step to protecting your trees is pruning, which is essential for their health. Prune out diseased, damaged, or dead limbs; this stops problems from spreading. Also, prune any branches that cross over each other, as well as any overcrowded areas. This improves sun exposure and air circulation, which prevents fungus. It’s usually better to let a professional handle pruning, as making a mistake could irreversibly damage the trees. You can contact us at Mr. Tree for your pruning needs. If have any concerns about your trees, you can consult with a certified arborist. Professional arborists have expertise and years of experience with pests in Oregon, so they’ll be able to accurately diagnose the problem and give you feedback on how to handle it. You can find plenty of information about Mr. Tree’s arborists, tree services, and more on our website.